All winners receive a Tournament Trophy plus a cash prize or a prize. One (1) point per pound for weighed Blue Marlin 450 lbs and over. Please view this video for an example of how this must be done. At 2 minutes into the video, you can see that as the fish comes to the boat, the number is clearly presented next to the fish and the video allows multiple opportunities for the correct species of fish to be clearly indentified and also shows the fish being released safely. IN THE EVENT THAT ASF RADIO CANNOT BE CONTACTED, 'YOU MUST" RELAY THE HOOK UP THROUGH ANOTHER BOAT. 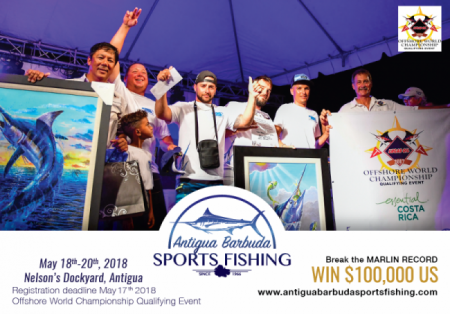 With the help of our sponsors, teams that enter the Marlin Division in the 2017 Antigua & Barbuda Sports Fishing Tournament ONLY have a chance to win a grand cash prize of US$100,000.00. This will be awarded to the boat that catches the largest Blue Marlin over the current tournament record of 771.25lbs during the 2 days of fishing. Most tag & releases are determined by the amount of Bill Fish released. In the event of a tie, the winner will be determined by points. In the event of a tie with points, time will determine the winner. Prize of most tag & releases goes to the boat. The official time of release is recorded when ASF Radio is notified of the release and not at the time when hook up is reported. EC$300 per rod -Minimum of 4 – maximum of 6 rods. Boats entering the Marlin Division must pay EC$150 to qualify for sporting division.